Laurel Harper, the mother of Oregon shooter Chris Harper-Mercer, authored online posts where she detailed her son's developmental condition, the family's views on gun control, and gave advice on certain medical conditions, according to The New York Times. In most of the online posts, which Harper published over the span of about 10 years, she describes herself as a nurse and gives internet users guidance on health issues, according to CNN. But in some of the other posts, Harper talks about "lame states" that impose limits on keeping loaded firearms in the home and professes pride for her son, whom she wrote had a deep knowledge of guns and gun laws, according to the Times. Harper's views in the post seem to contrast sharply with those of her former husband Ian Mercer, who told CNN that the shooting would not have happened if their son hadn't had access to 14 guns. He said that other nations don't see mass shootings in numbers that even remotely compare to what the U.S. has seen recently, according to CNN: "Somebody has to ask the question: How is it so easy to get all these guns?" I keep two full mags in my Glock case. And the ARs & AKs all have loaded mags. No one will be "dropping" by my house uninvited without acknowledgement. Harper was apparently referring to a Glock handgun and two military-style rifles — three guns of this type and description were discovered by police later. Neighbors also told investigators that Harper and her son would go target shooting together, according to CBS News. 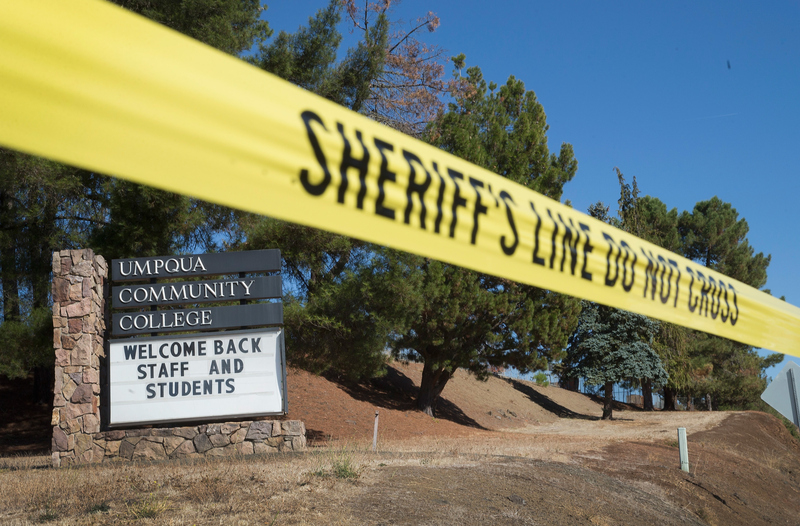 The Oct. 1 shooting at Umpqua Community College, where Harper-Mercer is the prime suspect, left nine people dead and nine people seriously wounded, according to Newsweek. Then, Harper-Mercer turned one of the six guns he'd brought with him on himself, according to the Times. Investigators said they recovered a total of 14 firearms and spare ammunition magazines that were purchased legally either by Harper-Mercer or an unnamed relative. The eight guns not found at the scene of the crime were discovered in the second-floor apartment he shared with his mother, according to the Times. Harper also claimed that both she and her son had Asperger's syndrome, an autism spectrum disorder. He's no babbling idiot nor is his life worthless. He's very intelligent and is working on a career in filmmaking. My 18 years worth of experience with and knowledge about Asperger's syndrome is paying off. Fact: Before my son was even born, I was reading out loud to him from Donald Trump's The Art of the Deal. And as for the "gesture effect," I was practically a mime. And now my son invests in the stock market along with me, turns a profit and is working on a degree in finance. His language and reading skills are phenomenal. I tell you this because it's not too late for you to start helping your daughter. Neighbors in the apartment building where Harper-Mercer lived with his mother described him as distant and quiet, according to the Times. When his mother went to her nursing job at night, a tenant at the apartment below Harper-Mercer's told the Times that she could hear him pacing until 3 or 4 a.m. I have noticed that so many people like [Flanagan] are alone and unknown, yet when they spill a little blood, the whole world knows who they are. A man who was known by no one, is now known by everyone. His face splashed across every screen, his name across the lips of every person on the planet, all in the course of one day. Seems like the more people you kill, the more you're in the limelight. Harper-Mercer's motive is still unclear, and no one has been able to reach his mother since her online postings have been discovered, according to the Times.